Fruits Even the most healthy diet can’t guarantee a long life, but active and healthy seniors can increase their odds of staying that way by being aware of how aging changes their nutrient needs. The Food Guide Pyramid is a visual representation of what health officials consider to be the components of a healthful diet for everyone over age two. 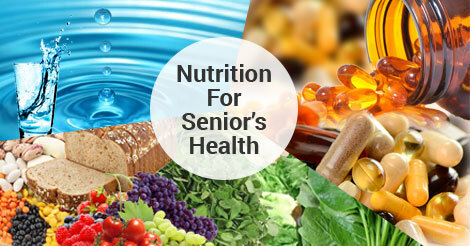 But seniors have some specific nutrient needs not addressed in the one–size–fits–all Food Guide Pyramid. The base of this revised pyramid is narrowed, signifying the reduced energy intake common among seniors. Most people eat fewer calories as they get older. With a typical energy (calorie) intake of 1200 to 1600 calories per day, elderly consumers have to make every calorie count in order to get enough of the essential nutrients. The 70+ pyramid, therefore, outlines the “Nutrient dense” choices in each food category, emphasizing whole grain or enriched breads and cereals, a variety of different colored fruits and vegetables, low–fat dairy foods, and lean meats, fish, poultry, and legumes. The major differences in the 70+ pyramid involve fiber, water and supplements. Icons throughout the pyramid highlight the importance of fiber in a healthy diet. This advice is important to seniors but applicable to all adults. Adequate dietary fiber works to control constipation, and a fiber–rich diet may help reduce the risk of heart disease and some types of cancer. High–fiber foods include whole grain breads and cereals, fruits, vegetables, and legumes. While grain foods anchor the Food Guide Pyramid, the 70+ pyramid is built on a base of water. Adequate hydration is a chronic problem for many seniors. Decreased thirst sensation is common with aging and some medications affect the body’s ability to regulate fluid balance. Dehydration also worsens the symptoms of constipation. To combat these problems, this alternative pyramid advises seniors to drink at least eight glasses of fluids a day. Keep in mind, though, that coffee, tea, and alcoholic beverages don’t count toward this total fluid intake because they all act as diuretics, causing you to lose water. Both calcium and vitamin D absorption decrease with age, this has adverse effects on bone health and increases the risk of fractures. The ability to absorb the amount of vitamin B12 needed for normal nerve function also decreases with age, making this another key nutrient in your diet. Depending on your dietary habits, you may not need dietary supplements, but this is an issue that all 70+ consumers should discuss with their health care providers. The 70+ pyramid is not designed to consider the special dietary needs of those with significant health problems, nor does it address the socio–economic factors–such as decreased income and mobility–that can make it harder for many seniors to meet nutrient needs. But all seniors, regardless of circumstances, should still hear the pyramid’s main message. people over 70 have specific nutrient needs, and how well you meet those needs can be influential in how well you face the challenges of getting older.